First I ate as many frozen vegetables as possible so I could fit the ice cream maker bowl in the freezer. This is what you call earning your ice cream. Then the heat wave hit and while I had enough space in the freezer, I didn't have all the ingredients. Oh noes! It's not exactly easy to get out to the store with a toddler and newborn in tow in the heat. So I resigned myself that this little project would have to happen another time. 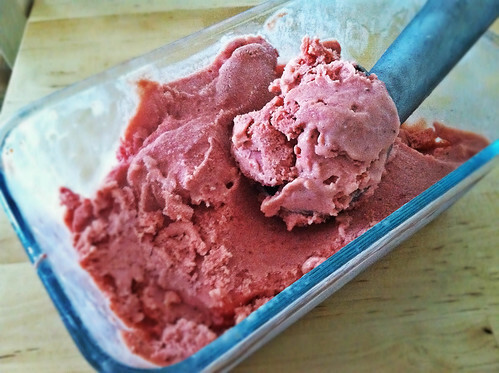 Well, fate had other plans because just as I had given up hope, I saw that Siobhan had posted a link on our Facebook page to a Bon Appétit slide show with a recipe for Strawberry Buttermilk Sherbet (one more reason you should be following us on FB). While I didn't have all the ingredients for ice cream on hand, I could make a sherbet with the contents of my fridge and freezer. Sweet victory was in sight! I adapted the recipe slightly and was very pleased with the results. All the flavors melded together nicely in the sherbet (please tell me I'm not the only one who wants to pronounce it sherbert). The balsamic and strawberries are up front and center on that initial taste but it finishes with the tang of buttermilk. While it's not as creamy as ice cream it's plenty refreshing for this hot weather we've been having. Here’s my modified recipe. When strawberries are in season I prefer to use the fresh stuff for immediate consumption, opting for frozen ones for cooking, feel free to use the fresh stuff if you prefer. Move oven rack to center position and preheat oven to 425° F. Line a large baking pan with parchment paper. Add strawberries and sprinkle with sugar then drizzle with balsamic vinegar. Roast the berries, until berries are softened and juices begin to bubble, about 20-35 minutes. Remove from oven and let cool. Purée berries and rendered juices along with buttermilk, sour cream, vanilla extract and salt in a blender until smooth. Transfer mixture to an electric ice cream maker and churn according to manufacturer's instructions. Store in an airtight container in the freezer until serving. This recipe sounds wonderful. I may have to brave the heat and go buy strawberries so I can try it out. This looks delicious! So happy the weather's cooled down a bit in NYC, but ice cream always sounds good!